The traditional Christmas yule log has been our dessert of choice for years during the holidays - and this year I finally made my own. The versatility of this dessert is great. You can flavor the filling however you choose and add flavoring to the genoise cake too. You can also make a simple whipped cream to cover the cake instead of the more traditional Christmassy buttercream. I loved the green color of the cake - it made it look wonderfully festive for a night of family gathering around a plethora of food. Preheat the oven to 350F. Separate the yolks from the whites. In a bowl, mix the yolks and sugar until the mixture whitens. Add the flour, and powdered pistachio gradually. In a separate bowl, add the pinch of salt to the egg whites and beat until the mixture forms stiff peaks. Gently fold the whites in the yolk mixture until the mixture is homogeneous and smooth. Line a baking sheet with parchment paper and spread the batter to form a 1/4 inch thick rectangle. Even out the batter using a spatula. Bake for 12-15 minutes. The cake is done when you can gently press the cake with your thumb and the imprint disappears after a couple seconds. Mix the mascarpone and melted chocolate in a bowl while the cake is baking, and place in the fridge until you are ready to use it. Lay a damp dish towel onto a flat surface and cover with a large piece of parchment paper. Once the cake is done, immediately invert it onto the parchment paper. Gently start rolling the cake (as you would sushi) until you form a log. This must be done while the cake is still warm in order for it not to crack. Leave the rolled cake to cool down. In a large bowl, beat the eggs with a whisk while progressively adding the sugar. Continue beating it over a bain-marie until the mixture thickens. Remove it from the heat and continue beating it until it cools completely. In a separate bowl, beat the butter and salt using an electric mixer until it ressembles whipped cream (5-10 minutes). Add the vanilla. Add the butter to the cooled egg mixture. The eggs must be cooled in order not to curdle. Mix until the buttercream is homogenous. Unroll the cake and gently spread the mascarpone mixture on one side. Make sure the layer is even and not to close to the borders. Gently roll the cake up again. An additional, optional step is to wrap the entire cake in plastic wrap, twist it at the ends, and let sit in the fridge for 20 minutes to compress the layers together. Cover the cake with buttercream and decorate as you please. Enjoy! My favorite Yule Log !!!!! I love it! Enjoy the holidays ! That is one beautiful yule log! I just love baking with marscapone. This looks amazing! Hope you had a wonderful Christmas! Got any leftovers? Wow, this is gorgeous. Love the color. I am so intimated by the Yule Log! Hoooo why didn't I think of using pistachios for this log? I am sure it tasted great. That looks great! I really like the use of the pistachios! Absolutely gorgeous! I'm a fan of pistachio. What a beautiful yule log - the color is magnificent! Love the flavors too. Hope you're having wonderful holidays! What a mouthwatering photo! I love the colors. 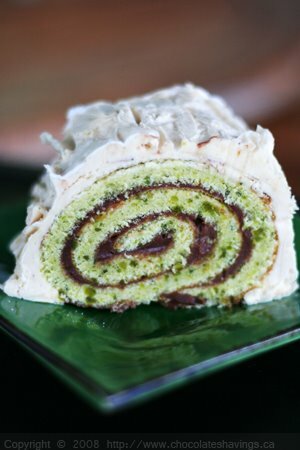 Chocolate and cake is good, pistachio makes it over the top! mmm! this pinwheel looks perfect! thank god someone finally used pistachio in a christmas cake--all of the DB buche's are all looking the same, so much, chocolate! eh, but looking down the page, i'm in love with that photo of the chocolate truffles. I just found your blog and wanted to drop in and say hi! Gorgeous! What an awesome recipe. I adore anything pistachio and chocolate!